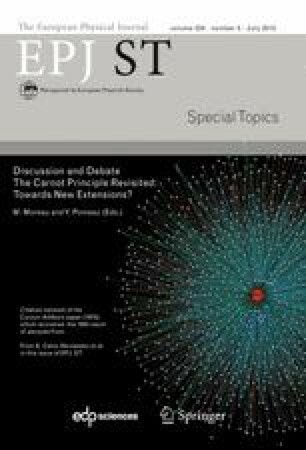 Discussion and Debate: The Carnot Principle Revisited: Towards New Extensions? Classical equilibrium thermodynamics is a theory of principles, which was built from empirical knowledge and debates on the nature and the use of heat as a means to produce motive power. By the beginning of the 20th century, the principles of thermodynamics were summarized into the so-called four laws, which were, as it turns out, definitive negative answers to the doomed quests for perpetual motion machines. As a matter of fact, one result of Sadi Carnot’s work was precisely that the heat-to-work conversion process is fundamentally limited; as such, it is considered as a first version of the second law of thermodynamics. Although it was derived from Carnot’s unrealistic model, the upper bound on the thermodynamic conversion efficiency, known as the Carnot efficiency, became a paradigm as the next target after the failure of the perpetual motion ideal. In the 1950’s, Jacques Yvon published a conference paper containing the necessary ingredients for a new class of models, and even a formula, not so different from that of Carnot’s efficiency, which later would become the new efficiency reference. Yvon’s first analysis of a model of engine producing power, connected to heat source and sink through heat exchangers, went fairly unnoticed for twenty years, until Frank Curzon and Boye Ahlborn published their pedagogical paper about the effect of finite heat transfer on output power limitation and their derivation of the efficiency at maximum power, now mostly known as the Curzon-Ahlborn (CA) efficiency. The notion of finite rate explicitly introduced time in thermodynamics, and its significance cannot be overlooked as shown by the wealth of works devoted to what is now known as finite-time thermodynamics since the end of the 1970’s. The favorable comparison of the CA efficiency to actual values led many to consider it as a universal upper bound for real heat engines, but things are not so straightforward that a simple formula may account for a variety of situations. The object of the article is thus to cover some of the milestones of thermodynamics, and show through the illustrative case of thermoelectric generators, our model heat engine, that the shift from Carnot’s efficiency to efficiencies at maximum power explains itself naturally as one considers continuity and boundary conditions carefully; indeed, as an adaptation of Friedrich Nietzche’s quote, we may say that the thermodynamic demon is in the details. This article is supplemented with comments by J.M.R. Parrondo and a final reply by the authors.